One of my biggest pet peeves is the pile of shoes by the door. We are a shoe off-at-the-door-kind of family. It keeps my house cleaner, and with four little ones, we spend a lot of time on the floor -playing, reading, wrestling, hosting stuffed animal & baby doll tea parties, eel hunting -the list goes on forever. But I just hate that pile of shoes at the door. Even if each person only has one pair of shoes at the door, with six people, it quickly becomes a pile of at least a dozen loose flip flops, sneakers, boots, or sandals -just sitting there. I don't mind a small basket of shoes, or a few tidy shoe cubbies, but with my crew, even a small basket doesn't really accommodate us. Enter the best thing I found ever . . . The larger one is not only taller, but deeper and includes a drawer. 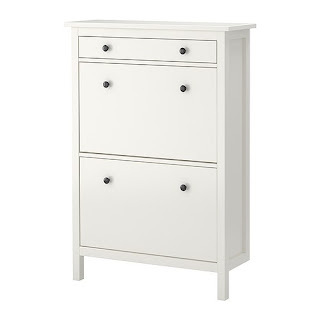 Prior to now I've never been a big Ikea furniture fan. I love all their space saving strategies and their organizational goodies, but their furniture, not so much. But this shoe problem was starting to make me desperate for a solution. And I love it. The drawers slide open, easily accommodating even my husband's big ole shoes. The taller one has a double row in each compartment. In fact, I loved it so much, I bought two. How do you solve your shoe problem? Or do you even have one? It's not just us, right? Thanks Lisa. I love how much it holds! Especially for such a narrow piece. You know I have seen these made from old nightstands. I guess you could use just about any piece of furniture. There are directions on the web & Youtube & really looked easy! I am even contemplating giving it a whirl because I despise that pile, also. I started using a wine crate & now it looks even worse because it is always overflowing. Thanks for the tip! I usually check the Internet for DIY ideas first, but since we have so many projects going on right now, it didn't occur to me. Plus, I have so little patience for any kind of clutter in that space, that purchasing something cheap from Ikea seemed like the route. We did consider stealing some of the components to make something different in the future though. 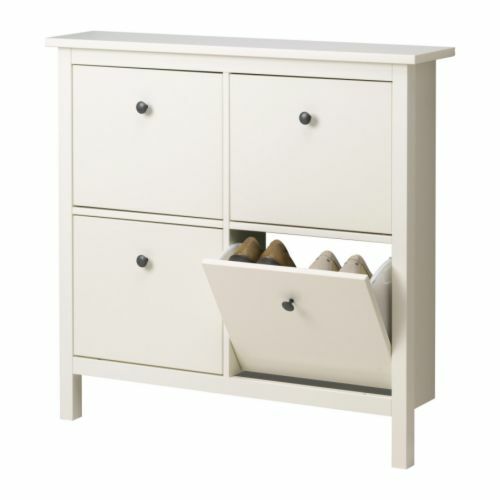 Yes, we are a 'shoes off' family, too, and saw this cabinet on IKEA's site, and it's so cool, glad you got it! 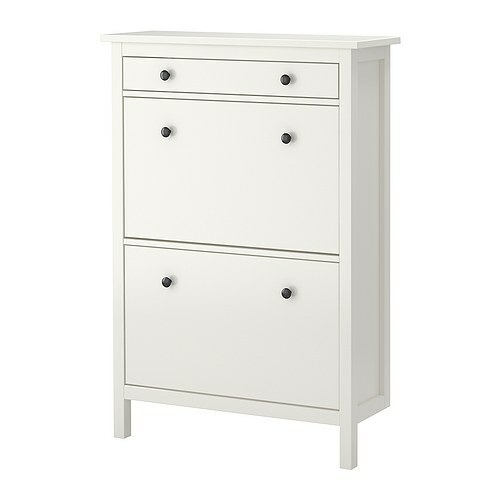 Our hallway is insanely small, and tried the shoe storage method in a chest of drawers, but somehow it was more of a pain to put them inside the drawers, then clean the drawers when they got dusty, but I think the IKEA cab/shelf would be easier to use. Loved your blog, full of interesting and informative things I'll always be here! Have a day full of good things, and much peace in my heart! amend your wеb site, how caan i suƄscribe for a blog site?